If you ask me this is the best way to start school. On the road while my husband is on a musical tour in Wisconsin. 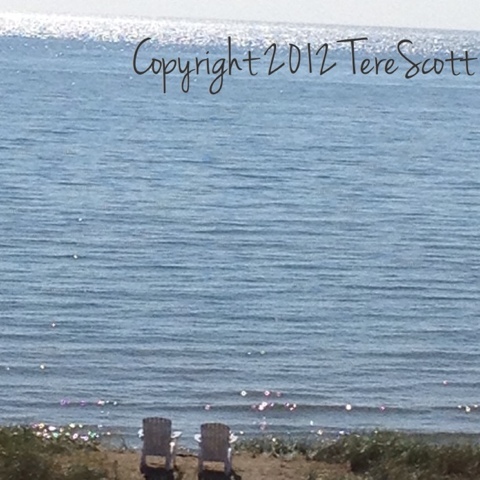 Yesterday my kiddos walked a beach played in a water park and swam. No book work just yet but we learned. We were talking about Neil Armstrong and the space program while we drove. We learn a lot by daily questions of sheer curiosity. We learned that astronaut buzz aldrin had a communion service on the moon but NASA refused to broadcast it due to a lawsuit. We learn a lot while on the road and nothing beats the breathtaking views for stirring a realization of our creator. Recently I had the privilege of reviewing a book that could, quite honestly, change the world of childhood obesity in America. At least, it should. The book is called Healthy Foods from A to Z Comida Sana de la A a la Z. As you can tell by the title, the book is bilingual. It presents healthy food pictures touting various expressions, using both English and Spanish words, and grouping them together based upon what letter of the alphabet the food name begins with. The publishers sent me the book in exchange for my opinion. My daughter and I had a ball enjoying all the fun food-created faces. Then, we went to town creating our own. This book is simply amazing. It takes a basic, simple, easy-to-understand concept of healthy eating and applies it to another concept that is not always so easy: Two languages and their alphabets. The languages chosen by Executive Editor, Stephanie Maze and photographer, Renee Comet, are English and Spanish. After your child makes it to the end of the book, there are additional activities to have fun with as well as an A to Z section for adults to learn the healthy impact and value of each food introduced in the book. 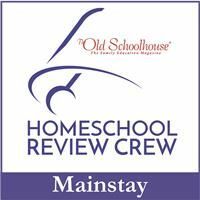 This book would make a welcome and healthy addition to every school, including homeschool, library. It combines language concepts from both English and Spanish, health and food science-based learning, math concepts of discovering shapes, interpersonal socialization skills using emotional expressions on each presented face and art. It also opens up communications about healthy food choices and other conversational topics, in a light-hearted manner, between parents and children. It's fun to page through just to look at the funny food faces. It's also an enjoyable way to learn letter shapes and sounds of both English and Spanish words and shapes and math concepts along with a touch of art. It’s back to school time and that means stocking up on school supplies. AstroBrights Paper turns the mundane paper supplies on your list into something colorful. AstroBrights Paper wants to make your back-to-school moments even brighter with their "Give a Brighter Year" sweepstakes. Win $500 cash and school supplies valued at $30,000 for the school of your choice. Just visit their Facebook page app and fill out the basic information, including the school you want the supplies to go to. Hurry! The contest ends on September 10, 2012. Looking for some bright and creative ideas for using AstroBrights Paper? A countdown to the start of school would be very cheerful using AstroBrights Paper. Anything from a calendar designed marking off each day to a colorful paper chain, tearing off a new color for each day counted down. My kids have recently become interested in the art of origami. AstroBrights Paper helps to create some colorful origami designs. My elephant-loving daughter was thrilled to discover that making an origami elephant face is not all that difficult. With AstroBrights Paper, we could design a rainbow of elephants and other creations. AstroBrights Paper comes in 23 bright colors on durable paper that allows you to add a personal flare of color in all your back-to-school projects, chore lists, notes, scrapbooking summer vacation or book reports, invitations and a host of art projects. Don’t stop there. After you enter the sweepstakes, get some bright ideas and inspiration from the family-friendly “Make Something Astrobright” design challenges at Astrobrights on Facebook. 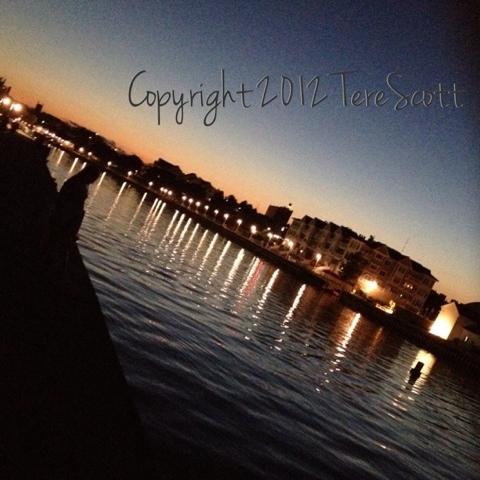 Share your bright ideas, pictures and video and grab inspiration from others. Most parents know that safety reflectors are helpful in keeping kids safe while walking near busy streets, especially during dusk/dawn or night-time hours. But, what about your family’s pet? Much of the walking that some families do is for the simple act of walking Fido. Often, this involves at least one after sunlight hours walk. It is a good idea to have some form of safety reflector or light on the dog, but this can be a tricky endeavor for some little four-legged friends who won’t wear safety gear. 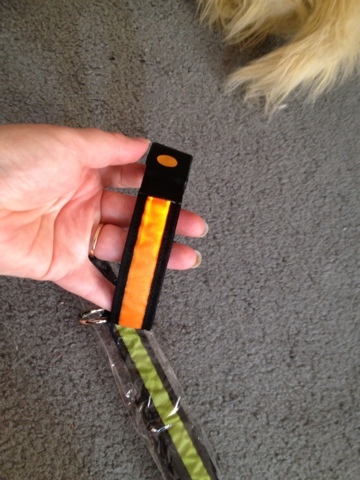 That’s where this new collar, called the Safe Glow dog collar, comes into play. 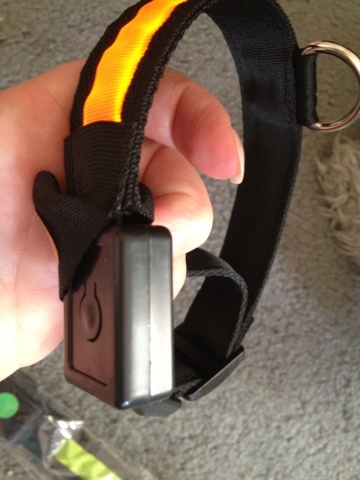 I received the Safe Glow dog collar in exchange for an honest review of what I thought, including pros and cons. 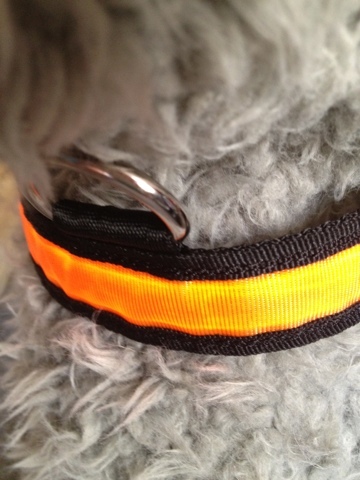 Following is that review of the product plus your chance to win a collar for your furry little friend. What I discovered was that this collar is really cool. It has a really quality feel to it, yet is not too heavy for Fido’s little neck. It is extremely easy to turn on/off the safety light glow, and is very easy to select which flashing or steady light you prefer. Since I have to find a con, I looked hard to find one. The only possible con, and I’m really stretching it to include any cons as I loved this collar, is that if your dog gets caught in a complete drenching downpour rainstorm, it’s possible that the collar would get soaked and interfere with the battery box and stop it from working. I do not know as I was not caught in a rainstorm. One other possible con might be the possibility of pinching your or your dog’s skin in the clasp when putting collar on. 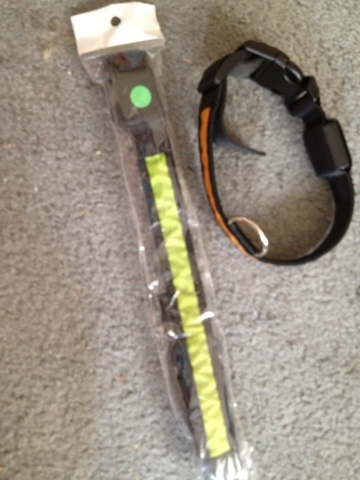 The collar retails for $29.95 and can be found here at www.dogtrainingcollars.com. And, now for the really fun part: You could win won of your very own for your family's pet!!! Fill in the name of your pet, or the lucky pet who will receive the dog collar as a gift. Bichon Frise, Chihuahua, Italian Greyhound, Maltese, Miniature Pinscher, Pomeranian, Miniature Poodle, Minature Schnauzer, Silky Terrier, Yorkshire Terrier and most teacup breeds. The small collar also fits some cats. Comment today. Contest will end August 23 at midnight CST. There is good news after all. This new book by Lynea Gillen is refreshing in more ways than the title, Good People Everywhere, suggests. This book is a sweet child's bedtime book, a fantastic way to start the day book, a pick-me up in the middle of the day book and an all around mood lifter anytime you need encouragement. The book's author, Lynea Gillen, knew there was a way to influence young children in a way that counterbalances the bad news heard everyday. She decided to write a book about all the good that people do. Focus on the good, and don't dwell on the bad. The book begins talking about how, in neighborhoods all over the world, people are doing good. It then walks through colorful illustrations, provided by Kristina Swarner, of everday people doing good. You will see carpenters, chefs and school teachers. But, what I loved was how she included midwives as well as doctors and gave credit to mommies who cook and take care of their children as well as workers in other industries. I love how she includes a teenager doing good, as the teen years are so often attributed to nonsense and a time of self absorption instead. At the end of the book, she challenges the reader to do good by asking, "I wonder what you will do?" Following this is a "Good Person" Award your child can personalize and an invitation to visit www.ThreePebblePress.com for more home and school activities. It’s great to save money, but driving all around town to redeem a coupon isn’t always the best option. Saving money is just the beginning of what should be a victorious shopping experience. Your time is worth something too. It’s nice to find everything you need in one place for a great price. The first victory is the time you save. Famous Footwear has all of your back-to-school shoe needs in one place. Even for homechoolers, like us, who sometimes learn in our pajamas and comfy slippers. They will get you in and out in no time. If they don’t have what you want, they will get it for you and deliver it to your home or your favorite Famous Footwear store for pickup, or you can order everything online and pick them up at the store for no extra charge. The second victory is finding what you want at a price you can afford. Famous Footwear has hundreds of brand name shoes and thousands of styles at low prices. Print this coupon and redeem it at your favorite Famous Footwear location before August 18, 2012. I just saw this DIY "funky button and bead bouquet" posted on my Facebook page. It is from Offbeat Bride posted online and thought it was such a unique idea. 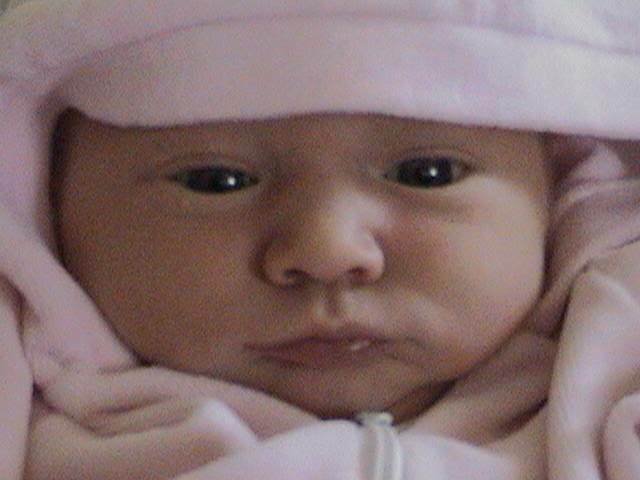 I just had to share it with you. I thought - hmmmm. This could also make a fun arts and crafts project or even be the centerpiece for an entire art lesson. You might even have all of the needed supplies around the house. If not, a trip to Hobby Lobby never hurt anything but the pocketbook. Or, check out local thrift stores who often have second-hand items you can repurpose. The potential for this adorable craft item is limitless. I can't wait to see what you decide to do with this idea. Please post a pic on my facebook page of how your bouquet turns out.